Rare view of Valletta, Malta. 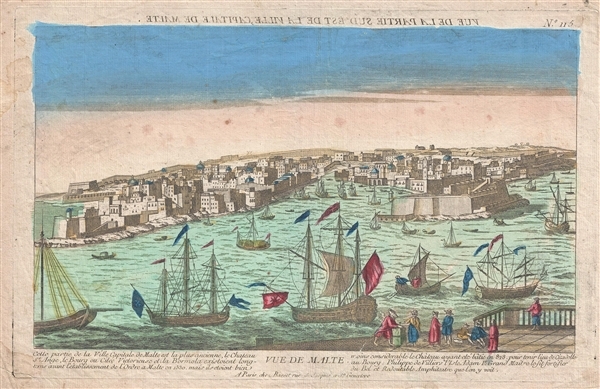 An uncommon c. 1780 optical view of the city of Valletta, capital of Malta. The view reveals a busy and well defended harbor. Published by Chez Basset, Rue St. Jacques a Ste. Genevieve, Paris. Optical Views, or Vues d'Optique, became popular in Europe in the middle part of the 19th century. These view, defined by exaggerated convergence lines, were intended to be studied through large lens and mirror apparatuses that emphasized the 'perspective' effect. This is the reason that the title, at the top of the view, is written in reverse. Purveyors and publishers of optical views began to pop up all over Europe. Basset, the publisher of the present view, was one such well known establishment in Paris. Good. Old color. Some soiling and age toning.